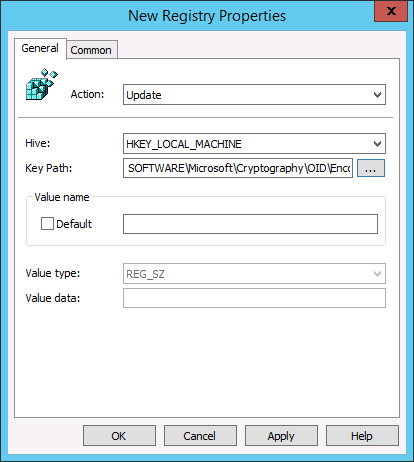 A software update is available for Windows 8, Windows 7, Windows Vista, Windows Server 2012, Windows Server 2008 R2, and Windows Server 2008 that allows deprecation of weak cryptographic algorithms. In order to use automatic updates from Microsoft as a means to be better protected from weak cryptographic algorithms, this software update must be downloaded and installed on computers that run the aforementioned operating systems. This software update is built-in to the Windows 8.1 and Windows Server 2012 R2 operating systems. What does this software update do? Define policies to selectively block cryptographic algorithms that override settings provided by the operating system. Opt-in or opt-out of each policy independently. 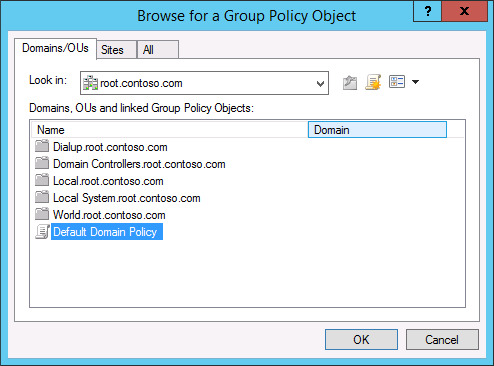 Enable logging per policy (independent of other policies). Logging is off by default. Specify a location to which blocked certificates are copied. Define the name of the hash algorithm, such as MD5 or SHA1. Specify if the policy applies to certificates that chain to third-party root CAs, which excludes the enterprise certificates, or to apply the policy to all certificates. Specify a time before which the policy check is disabled (only applicable to code signing certificates used in time-stamped signed binaries). All certificates. Note: If the policy is enabled for all certificates, then an administrator cannot allow weak cryptographic algorithms for a specific Enhanced Key Usage (EKU), such as Server Authentication EKU or Code signing EKU. Certificates that have the Server Authentication EKU. Certificates that have the Code signing EKU. Certificates that have the Time Stamping EKU. Specify whether the policy applies only to signing certificates of binaries downloaded from web or to all binaries. Specify code signing and time stamping certificates that are not blocked (such as those used in legacy code signing or time-stamping situations); the certificates are identified by using their SHA2 thumbprint. Define the algorithm name and minimum key size, such as RSA, DSA, and ECDSA. Specify if the policy applies to certificates that chain to third-party root CAs, which excludes the enterprise certificates, or if the policy applies to all certificates. Specify a time before which the policy check is disabled (for time-stamped files). All certificates. Note: If the policy is enabled for all certificates then an administrator cannot allow weak cryptographic algorithms for a specific EKU, such as Server Authentication EKU or Code signing EKU. ValueType Flags: REG_DWORD data type that can be set to disable the hash algorithm or enable a minimum key length. For more information, see the following table. MinBitLength: REG_DWORD data type that specifies the minimum public key length in bits. Note: MinBitLengh is only applicable to key algorithms policy. AfterTime: REG_BINARY data type that contains an 8 byte FILETIME. The weak crypto algorithm check is disabled for time stamped files before this time. This configuration value isn’t applicable to timestamp chains. Sha256Allow: REG_SZ or REG_MULTI_SZ data type that contains the list of certificate SHA256 thumbprints (ASCII_HEX formatted) identifying weak certificates to be explicitly allowed. Non ASCII_HEX characters in the string are skipped, which allows embedded spaces. CERT_CHAIN_ENABLE_WEAK_SETTINGS_FLAG (0x80000000) If this flag is not set, then all other flags and registry values are ignored for this Weak<CryptoAlg><ConfigType>. If the administrator sets this flag for its Weak<CryptoAlg><ConfigType>, then, the corresponding settings provided for the operating system are ignored. - Resultant "Weak<CryptoAlg>"ThirdPartyAfterTime" will be earliest ("Weak"<CryptoAlg>"AllAfterTime", "Weak"<CryptoAlg>"ThirdPartyAfterTime"). Note: Only applicable if "Weak"<CryptoAlg>"AllAfterTime" is defined and nonzero. CERT_CHAIN_ENABLE_WEAK_LOGGING_FLAG (0x00000004) This flag is set to enable the logging of weak certificates to the directory identified by CERT_CHAIN_WEAK_SIGNATURE_LOG_DIR_VALUE_NAME. CERT_CHAIN_ENABLE_ONLY_WEAK_LOGGING_FLAG (0x00000008) This flag is set to only log weak certificates to the directory identified by CERT_CHAIN_WEAK_SIGNATURE_LOG_DIR_VALUE_NAME. Weak signature errors are not returned. CERT_CHAIN_DISABLE_ALL_EKU_WEAK_FLAG (0x00010000) Disables the algorithm corresponding to that policy for all EKUs. CERT_CHAIN_DISABLE_OPT_IN_SERVER_AUTH_WEAK_FLAG (0x00040000) Disables the algorithm corresponding to that policy for ServerAuth EKUs for applications that opt into this change using CERT_CHAIN_OPT_IN_WEAK_SIGNATURE. CERT_CHAIN_DISABLE_SERVER_AUTH_WEAK_FLAG (0x00100000) Disables the algorithm corresponding to that policy for ServerAuth EKUs. CERT_CHAIN_DISABLE_CODE_SIGNING_WEAK_FLAG (0x00400000) Disables the algorithm corresponding to that policy for code signing EKUs. CERT_CHAIN_DISABLE_MOTW_CODE_SIGNING_WEAK_FLAG (0x00800000) Disables the algorithm corresponding to that policy for code signing EKUs only when the binary is downloaded from the web. CERT_CHAIN_DISABLE_TIMESTAMP_WEAK_FLAG (0x04000000) Disables the algorithm corresponding to that policy for timestamp EKUs. CERT_CHAIN_DISABLE_MOTW_TIMESTAMP_WEAK_FLAG (0x08000000) Disables the algorithm corresponding to that policy for timestamp EKUs only when the binary is downloaded from the web. The following procedure shows how to configure the registry settings on all domain-joined machines using GPUpdate. 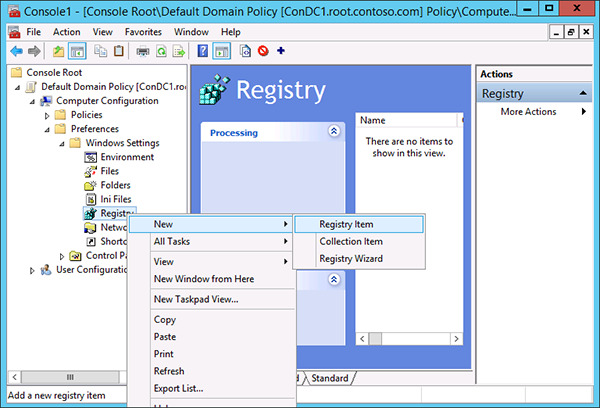 For more details, see Configure a Registry Item. On a domain controller, open Group Policy Management Editor. 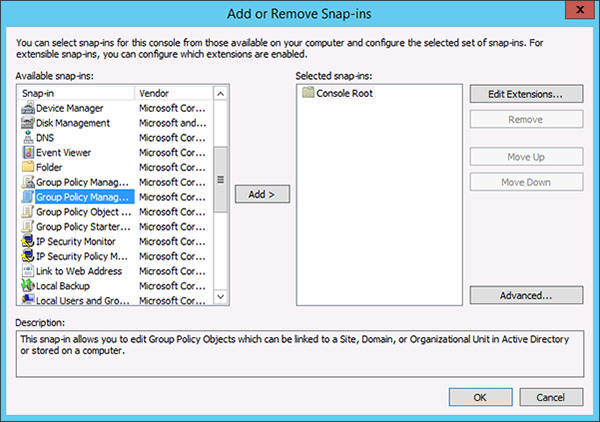 Open MMC, click File, click Add/Remove Snap ins, and select Group Policy Management Editor. 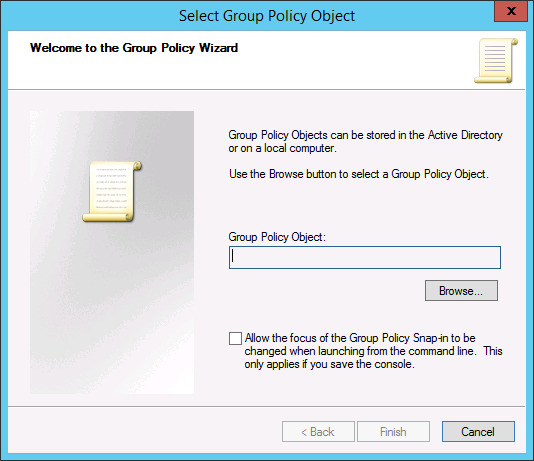 Click Add to start the Group Policy Wizard. Click Browse, click Default Domain Policy, click OK, and click Finish. Expand Default Domain Policy|Computer Configuration|Preferences|Windows Settings|Registry. Right-click Registry, click New, and click Registry Item. 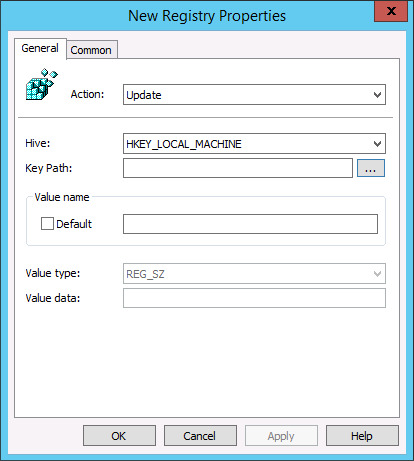 In the New Registry Properties, click Browse to select the required Key path. 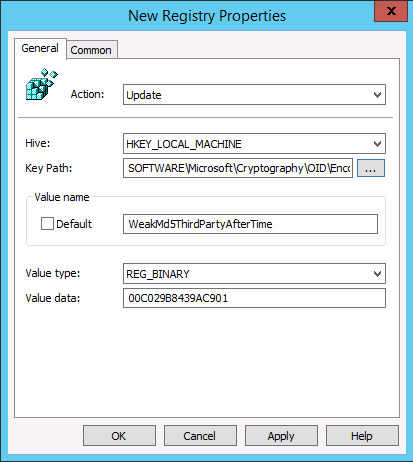 If the registry value name is already present select the registry value too, for example, WeakMD5ThirdPartyAfterTime. If the registry entry is new, select the key location, enter the registry value name, select the appropriate value type, and enter required data. Click Apply and OK. If necessary, run gpupdate /force on domain-joined computers to have the policy setting change be applied immediately. For binary values like AfterTime, it is recommended to first apply the value using CertUtil command or in a test computer and then export the values and import them to a domain controller. For example, if an administrator needs to apply WeakMD5ThirdPartyAfterTime, which is of type REG_BINARY to a date such as 1/1/2010, the administrator can execute the following CertUtil command on a domain controller. The command updates the registry with the correct binary value. After updating the registry, follow the previous steps to apply to the same value to domain-joined computers using Group Policy. The following example disables MD5 for all SSL server auth certs under third-party root CAs, but allows signed binaries before March 1, 2009 to be accepted. Not applicable to other EKUs. Logging is also enabled, and the message “Setting logging directory section” will appear. The following example disables RSA 1024 for all timestamp certs under third-party root CAs, but allows signed binaries before March, 2013 to be accepted. Not applicable to other EKUs. Weak Crypto framework provides a mechanism where administrators can set a log directory for all the certs which are considered weak according to settings. And update the flags to enable logging CERT_CHAIN_ENABLE_WEAK_LOGGING_FLAG (0x00000004), as in the following example, where weak crypto is applied for all EKUs and the weak MD5 third-party certificates are logged to c:\log.